Metabolic syndrome is a cluster conditions of increase blood pressure, high blood sugar, excess body fat. This condition will lead to risk of heart disease, stroke and diabetes. In previous decades, most of elder peoples has a high risk of this metabolic syndrome. But, due to unhealthy life style, metabolic syndromine start to get attacked to young adult. Most of this disorder accociated with metabolic syndrome have no symptoms, although a large waist circumference is a visible sign. If your blood sugar is high, you might have signs and symptomps of diabetes including increased thirst and uniration, fatigue and blurred vision. MetabolAid® by Monteloeder is natural ingredient combine of Hibiscus and Lemon verbena. It has several clinical study for human, in vitro. Mice specifically showed and activation of of PPAR-alpha, a receptor that promotes the breakdown of fat and lowers cholesterol, and AMPK, an enzyme that promotes energy burn. Researchers also observed in the mice an inhibition of FASN, an enzyme that promotes the creation of fat. 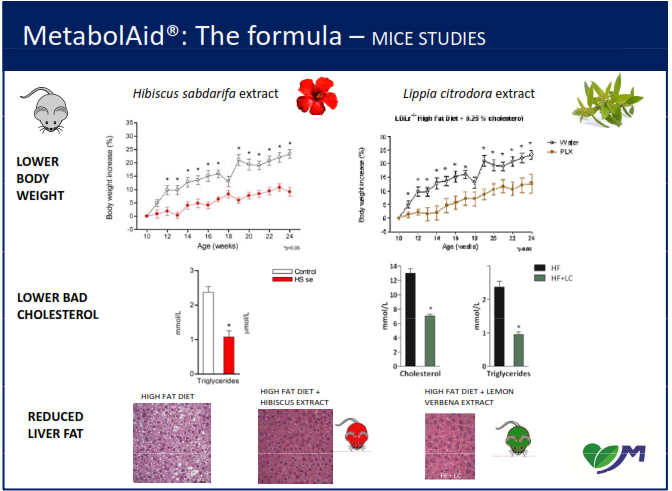 a lower level of the transaminases (enzymes) associated with liver damage in the MetabolAid group than in the placebo group.